Funny as you grow taller, one’s Christmas stocking grows smaller. One learns to compensate. The invaluable love of those that are treasured weighs in heavily. Cinnamon sticks wrapped in brown velvet ribbon, the sounds from the fire, the glow of candles, glorious music. Then there is Tolkein. 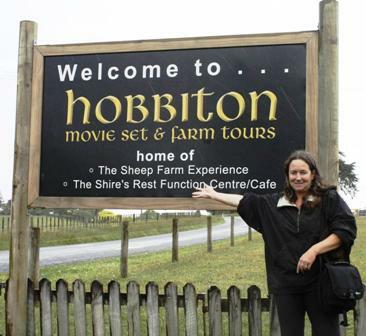 I made a promise, in writing, when I visited the Shire set in New Zealand that I would not publish my photos until the movie The Hobbit was released, which is now. I kept my promise. They had filmed only three weeks prior to my visit. I was so excited I could barely hear what I was being told about the set by the farmer who owns it. When Peter Jackson, the director, was flying around looking for a perfect place the chopper landed in this farmer’s field with the cute little lake. The famous director knocked on the door. A woman opened the door and told him to come back in two hours, her husband was watching the All Blacks play rugby, which Peter did! Little did they all know how impactful the fateful and historic encounter would be for them. Now the set is as important is their farm. You can see the idyllic setting dotted with their sheep. I have seen the movie today and it is as good if not better than the Lord Of The Rings. It was adorable, funny, and filled with drooling mountain trolls and all of the philosophy, action, and enchantment one needs to feel truly inspired. The younger Bilbo’s acting was absolutely wonderful, don’t pay any attention to that Globe and Mail reviewer who panned it. I saw the movie without 3D and it was absolutely fantastic. The local movie theater is playing my photos before the movie if you would like to see the photos. All very exciting and a great way to spend some holiday time. Happy holidays everyone! It has been a long while since I was in Jerusalem. As a younger woman I felt overwhelmed by the maelstrom of people and the fervent concentration of the churches of the world there. The ancient lane-ways and cobblestone streets literally sent me into a swoon. I was overcome by some malady as I strove to steady myself. Later, when I was better, a trip was made to Nazareth. It was a little disappointing. I remember staring at a bland Sea of Galilee, it seemed so nondescript, and there were bubbles on the surface of the water. I don’t know what I expected. Blind illumination. Perhaps some morphic resonance of the sacred. It seemed important to see these places right out of the starting gate of life and it all resounds profoundly regardless, as I listen to Handel's Messiah. Christmas is a time where what is abiding and enduring comes to the fore and all else falls away. What is abiding of course is eternal and that is the unraveling of the great mystery we all must journey. so be wise as serpents and innocent as doves." Sometimes we forgot the point of the December hullabaloo I studied and worked in archaeology when I was younger and I am currently following the documentaries by Canadian filmmaker and academic Simcha Jacobovici with avid interest. In 1980 a remarkable tomb was discovered in Jerusalem often referred to as the Talpiot Tomb. The implications of the tomb and contents have languished in dusty basements since but recently Professor Jacobovici has made some exciting extrapolations, and integrated noteworthy findings. The tomb has several features that are remarkable but primarily the ossuaries (bone boxes) contain names of principal characters and family members associated with Jesus Christ and also includes a box that may be that of Christ’s. What is more remarkable is the context. The statistics for finding a cluster of this type that dates to the time is worthy of serious consideration. I was further compelled when I saw a documentary made to refute these findings. Not only was it scant and emotional, it did not, to my mind, directly refute the careful research that has thus far been presented. Professor Jacobovici is working with many experts, including a DNA laboratory in Canada, and has published a book in conjunction with Dr. James Tabor, of the University of North Carolina, entitled, “The Jesus Discovery: The New Archaeology That Reveals The Birth Of Christianity.” Over the Christmas season these documentaries may be played again. They are definitely compelling and well worth checking out. These bones of contention in the holy land are ground breaking, earth shattering, and cutting edge and all very apropos for December 2012.